The postcards arrived at Miss Bury’s house in Leichhardt and brought with them the ocean and the full moon, clear nights and the sound of the waves. Their inscriptions, to someone reading them more than 100 years later, are enigmatic. They are easy to read as romantic suggestions, but are not necessarily so. Whatever innuendo they contain is a mystery. To take advantage of fine weather and visit the sea Miss Bury would first have to catch the tram along Parramatta Road into the city, where she would change for another tram to the coast. Sydney in 1906 was the Victorian city of awnings and railings, horses and carts, everyone wearing a hat, the streets busy. It was a new century and Australia had been declared a federation only a few years earlier. The city was constantly changing. Central station, with its grand concourse, had just opened. This video of Sydney in 1906, filmed from a tram moving along George Street, shows the criss-cross paths of pedestrians – men in suits, women in long dresses – as they make their way in between the trams (I particularly like the cyclist). To get to South Head involved a long tram trip to Watson’s Bay along New South Head Road, following the inner edge of the headland. 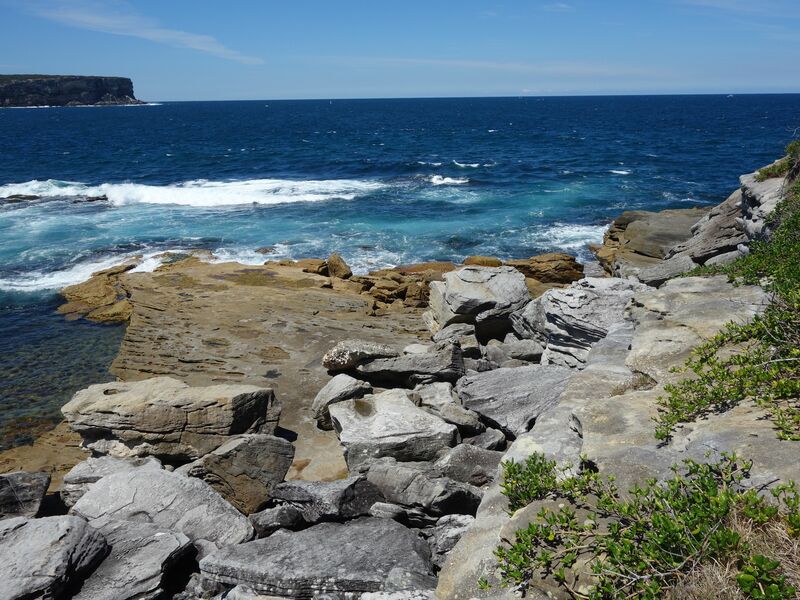 It was a sightseeing journey with views of the harbour and grand houses, past Barracluff’s ostrich farm at Diamond Bay and then ending at the ocean cliffs. Nearby day-trip attractions had sprung up, tea rooms and the octagonal building which housed a camera obscura in Gap Park (to be closed down in 1914 for fears that spies would use it to examine the military fortifications of South Head). People travelled here for a sense of distance from the city. Here they could turn their backs on it and look out across the endless ocean. This was the point where most of them or their ancestors had arrived in Sydney. Of the two promontories known as the Heads, South Head is further inside the harbour. 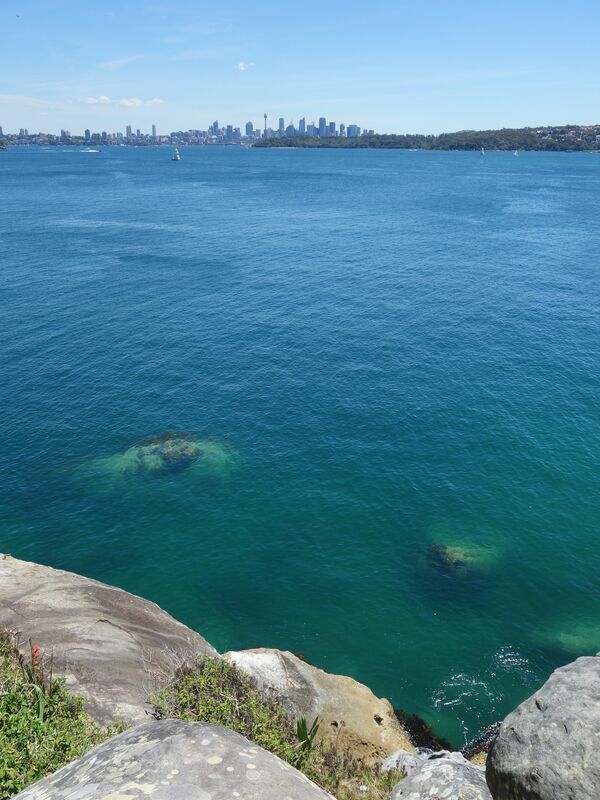 Ships travelling into Sydney would have rounded south head first, as they arrived from the south. Until passenger flights became commonplace in the 1950s the Heads were the symbolic, as well as the physical, entrance to Sydney. This, and the element of the sublime in the rough cliffs and ocean outlook, made them a common postcard feature in the 19th century. It is a sunny November day. The streets look fresh with the pale green of spring leaves and the mauve heads of jacaranda trees. Though it is more than a century after H.A.B’s message, taking advantage of fine weather is still a good suggestion. This Miss Berry, following Miss Bury, decides she will take advantage with a run out to South Head. I set out in the car, following the hills and curves through Double Bay and Rose Bay until I reach Watson’s Bay at the end of the road. The path that leads to South Reef begins at Camp Cove. Near the beach there is a lengthy information panel with a timeline of the area, beginning 220 million years ago in the Triassic period when layers of sediment accumulated to make the sandstone which forms the Sydney basin. 220 million years ago the earth’s landmass was one supercontinent, its giant fern forests roamed by dinosaurs. As I ponder this people stroll past, guys with an esky and a tambourine, towels draped over their shoulders, on their way to the beach. Cars crawl along Cliff Street, in search of parking spots. The wooden cottage on the corner, its white paint peeling, has a garden planted with mother-in-law’s-tongue and a gnarled frangipani tree. A more neighbourly 6000 years ago the Birrabirragal people lived here, fishing in the waters of what was to be named Camp Cove. Their life here continued without rupture until the first fixed date on the timeline: 21st January 1788. After this day, time and the land becomes increasingly divided up. The timeline goes on to list the headland’s many uses, by whalers and the military, the construction of a marine biology station, a lighthouse. Then the tourist age: cottages, a swimming hole, tea rooms, trams. The tourist era continues. 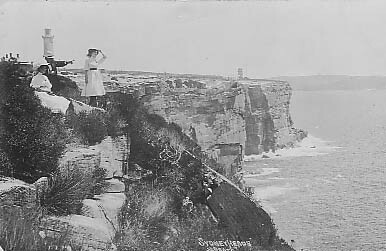 People are at the beach writing postcards and sunbaking, or walking the headland path, pausing to look at the view and take photos at the cliff edge. The path begins at the end of the beach and follows the shape of the headland. On either side are thickets of lantana and morning glory with desire paths cut through them leading to the cliff. There are danger signs, a cartoon figure slipping off the crumbling edge, but these often go unheeded. A group of girls in bikinis and towels squeeze past one large danger sign and its warning of serious injury, in search of an uninterrupted view. Between the huge sandstone boulders on the other side of the path is a stone wall with gaps in the bricks for rifles. 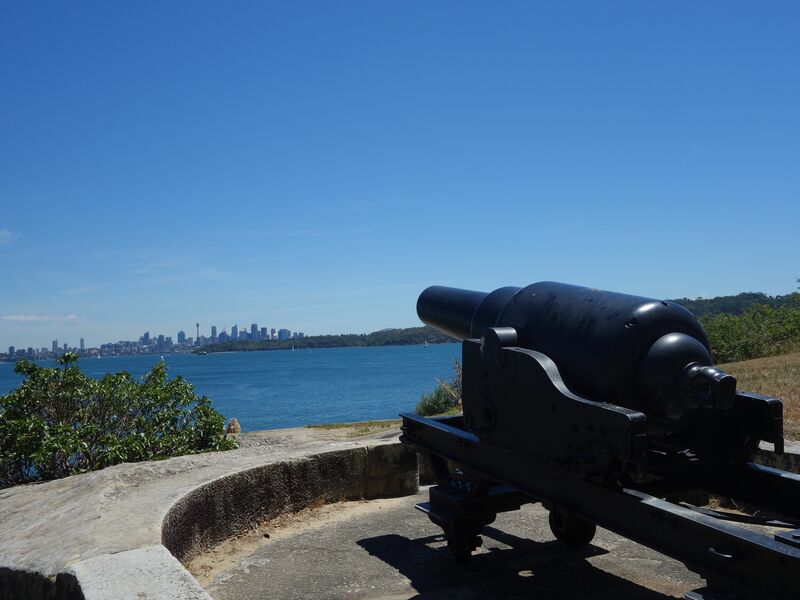 Nearby is a shiny black cannon mounted in a concrete well, pointing in the direction of the harbour and the city beyond. From here the city looks small, a tracing of vertical shapes against the sky. I think of the most recent of Tony Abbott’s stupid statements, this one delivered to David Cameron in celebration of Sydney’s English heritage. “As we look around this glorious city…it’s hard to think that back in 1788 it was nothing but bush”. Looking at it from the gun’s point of view, the city looks tenuous and its the wide stretch of harbour water and the zigzag shoreline of the bays and headlands that are the glorious thing. Sandstone boulders rise up like whales from the grass. Wrens hop between the branches of the lantana. After 1788 the vegetation was cleared from the headland and for a long time it had a bald look, traced with fortifications. In the early days of the colony it was from this headland that people would stare hopefully out to sea, looking for boats that might bring food or news from the rest of the world. 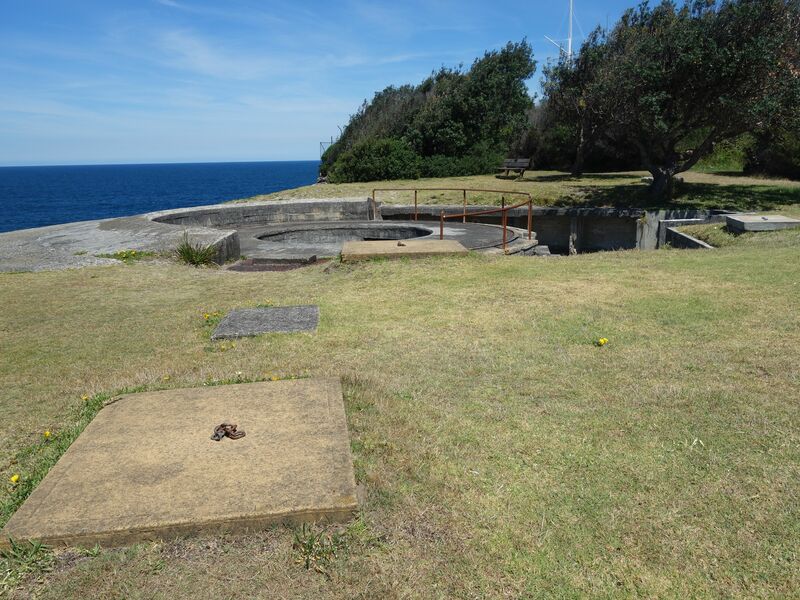 They were looking out for invaders, too, and over time the headland became pock-marked with gun emplacements, circular concrete wells sunk into the sandstone. The natural sandstone and the concrete blocks of the fortifications meld into a patchwork. The track continues, past Lady Bay below. For decades this has been a nudist beach and was officially declared so by Neville Wran in 1976. The beach is visible from the path above; an English family make jokes about averting their eyes as they peer downwards. Men are stretched out on the rocks alongside the beach, sunbaking and chatting and smoking. On the other side of the path is the naval base and here is another group of men sitting smoking, although these ones have their clothes on, and are turned away from the water to face the utilitarian buildings of the base. The path emerges from the shrubs at the lighthousekeeper’s cottage. Around from it is the red and white striped lighthouse, built after the wreck of the Dunbar in 1857. Everyone on the Dunbar perished, most of them wealthy Sydney residents returning home after a trip to London, apart from one deckhand, James Johnson. He spent three days on a rock ledge, with the debris and bodies from the wreck washed up on the rocks below. For days after the wreck, “hats, bonnets, boots, hams and drums of figs floated in the waves”. Eventually Johnson was rescued by an Icelandic man who was lowered down from the cliffs above by a rope. James Johnson, after recovery from his ordeal, became the first lighthousekeeper. The lighthouse, painted red and white like a candy-cane, is a cheerful structure. It has long been sealed up as the light operates automatically, but I climb up its external stairs and look out to seafrom the top of them. 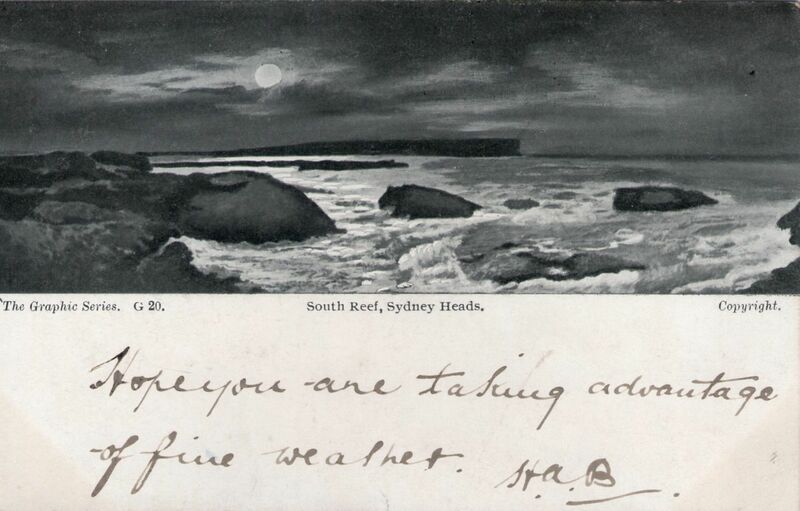 I can see the view from H.A.B.’s postcard, the rocks of the reef with the waves crashing against them and North Head in the distance, stretching into the ocean. In between the heads a few sailboats are out, catching the wind. It’s a strong wind straight off the sea and it whips my hair around my face and flutters the pages of the notebook a woman, lying on the grass below, is writing in. H.A.B., whoever they were to Miss Bury, did not end up as her husband. She married an A.N.W. in 1917. But I like to think that on a fine day Miss Bury and H.A.B. might have caught the tram to Watson’s Bay and looked out over the ocean together. The closest they would have got was The Gap lookout, rather than the reef pictured on the postcard. In 1906 this headland was a fortification, a military area with guns at regular intervals along the clifftop. The pits and tunnels of the concrete emplacements remain, now places to clamber into and scratch messages into the cement. 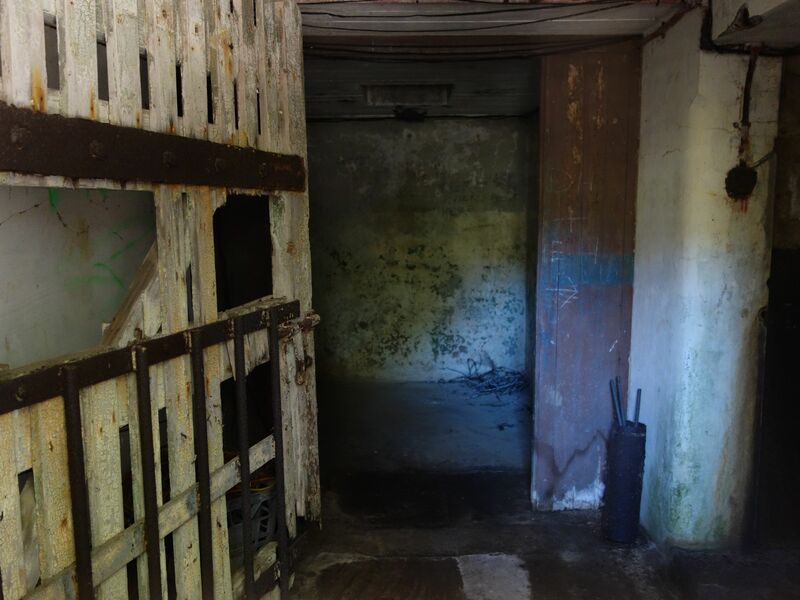 Most of the tunnels end in bricked-up walls or gaps too narrow to pass through, although beyond them is a network of tunnels, rooms and bunkers which connect up with the naval base. The entrances have mostly been closed off, but I find one door with a view into a gloomy series of rooms. Like the concrete of the gun emplacement above, there are names and sets of initials scratched into them. Alert for coincidence, I look for a H.A.B., but there is no match. The track loops around and I return to Camp Cove. As I pass by the kiosk a man is asking if they sell bananas. The woman in the kiosk looks at him, unable to decode his softly spoken request, and asks “Panadol?” I totter my way over the sand until I find a place in the shade at the other end of the beach to leave my bag while I go for a swim. Unlike Miss Bury, I can go swimming wearing whatever kind of bathing suit I like (in this case, a purple one piece). I fold my t-shirt and skirt and leave them on a rock as I make for the water. 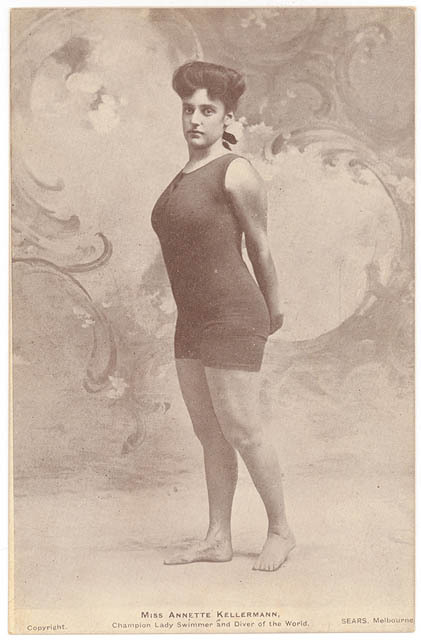 The propriety of bathing suits was a topic of great debate in the 1900s. 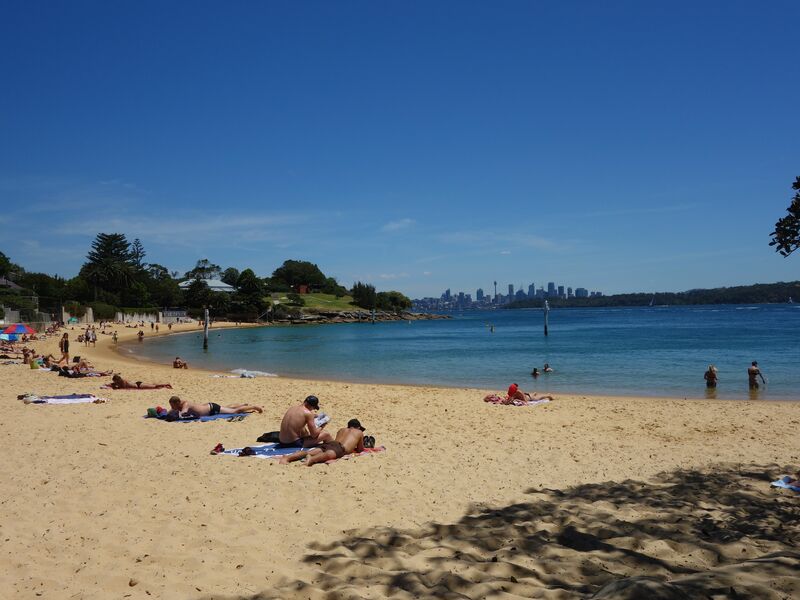 In 1903, a law that had prohibited “daylight bathing” at Sydney beaches since 1833 was repealed. With this came arguments over appropriate swimwear. A suggested mandatory skirt for men’s costumes led to the 1907 bathing costume protests, where men wearing women’s underwear, curtains and tablecloths marched on Bondi Beach. Men didn’t want to wear a skirt to swim, but neither did women. The baggy dress and pantaloons that were acceptable 19th century women’s bathing attire made it impossible to do anything but wade. Annette Kellerman designed the first one piece swimsuit with this in mind, and following her lead by the end of the decade women were wearing the close fitting costumes known as “Kellermans”. After swimming I sit watching the beach. Near me a group of girls in bikinis are eating strawberries. I look beyond them to a man and a woman at the water’s edge. The woman holds a stick and is using it to trace out something. The man tries to snap a photo of what she has written but she’s too close to the tide line and a wave dissolves the letters. I had seen it, though, before the water erased it, the tracing of initials into the sand. Further correspondence from H.A.B. 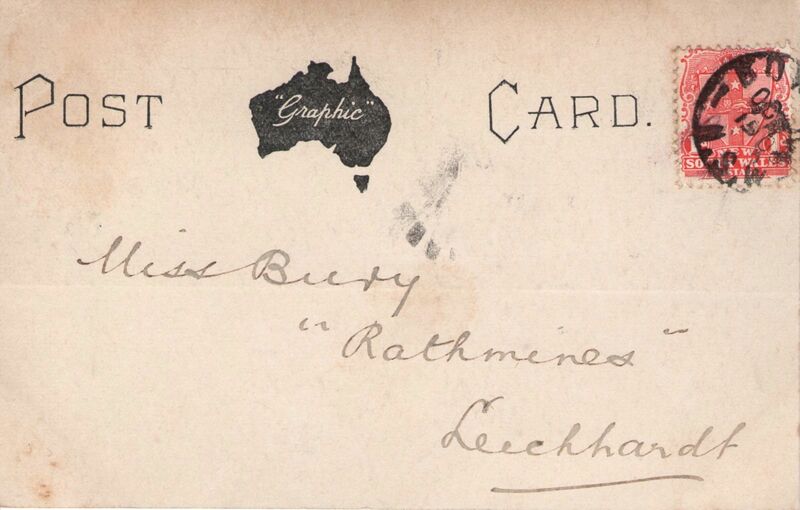 to Miss Bury: see card 57. Travelling on the escalators that lead down to platforms 24 and 25 at Central station, I always look out for the ghost platforms. They are visible in glimpses through the gaps in the striped panels that enclosed the escalators, but only for a moment, as the escalators keeps moving onwards, down to the Bondi Junction line, or up to the ticket gates. While thousands of people pass by them every day, the majority without knowledge of their existence, the ghost platforms remain still and undisturbed. What is mostly visible from the gaps in the panels are the station’s lights, which continue to shine even though the platforms are unused. The ghost platforms, numbers 26 and 27, are identical to the platforms below, although in raw concrete, and without tracks. A window in the door of the lift used to provide a glimpse of them, and I would sometimes take friends for rides up and down the elevator just for a ghost platform sighting, to the bemusement of others using the lift for more conventional purposes. The biggest clue to the platform’s existence can still be found in the lift: the button for platforms 26 and 27, although nothing happens when you press it. The ghost platforms are part of the city that never came to be. Similar blank, waiting spaces are found in the suburbs in corridors of land set aside for never built expressways, or buildings that remain forever for lease, as if cursed. These places are the architectural equivalent of the paths not taken in life, a reminder of the flipside of all decisions. I like to imagine that the trains that stop at the ghost platforms travel to all the potential Sydneys that could have ever been. The ghost platforms were constructed as part of the plan for an extended network of railways stretching to Manly in the north, and east to Kingsford and Coogee, designed by John Bradfield, the engineer most known as the mastermind of the Harbour Bridge. The idea for an eastern suburbs rail line first took shape in the late 19th century. Eventually the eastern suburbs railway to Bondi Junction opened almost 100 years later, in 1979, after a long history of plans, proposals and revisions, and the building of still unused platforms and tunnels at city stations. Today’s eastern suburbs railway ends abruptly at Bondi Junction, at which passengers must ascend to the confusing heights of the bus station, or disperse into the shopping mall. The ghost platforms were once used for document storage: photo by David Johnson. 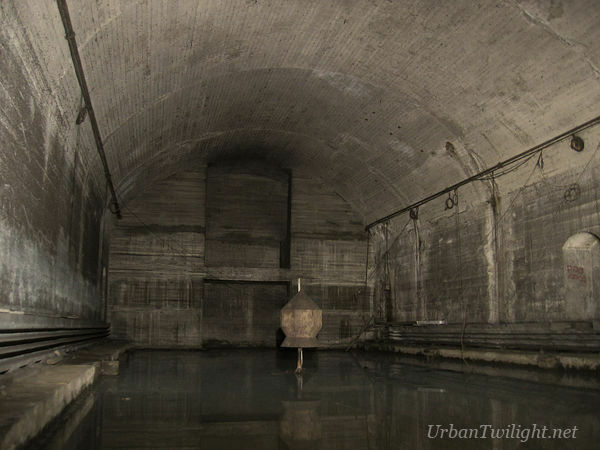 Sydney has many tunnels, a secret chthonic world known only to urban explorers and those who work with infrastructure. A Telstra employee once told me how there is a telecommunications tunnel that runs under the centre of the city, large enough to drive through (edit: see comments); this is where he spent his days working. Under Sydney is another city, that of pipes, drains and tunnels, some useful, others abandoned. A network of disused high pressure water pipes run throughout the city from the days when hydraulic power was used to operate lifts. Railway tunnels built around St James station for extensions of the rail line that never came to be were once used as air raid shelters. In one St James tunnel is a large bell, a faceted metal structure that resembles a giant gemstone, once used by the ABC to create the sound effect of Big Ben. Another tunnel underneath St James is now a lake, populated by eels and the occasional drain explorer on an inflatable dinghy. In the 1990s I sometimes came across the zine for the Cave Clan, Il Draino, and at the end of my street in Annandale, where there was a metal grate covering the concrete drainage channel that was Johnsons Creek, was a Cave Clan tag. The two Cs with a bolt between them was a promise of adventure. The members of the Cave Clan knew a different version of Sydney, an underground world of drains they explored and named. I read about drains with names like the Fortress and Eternity, and while I was too claustrophobic to ever be a drain explorer myself, I liked to imagine these underground realms explored by characters with equally curious names: Predator, Siologen, Trioxide, Ogre. We like the dark, the wet, humid, earthy smell. We like the varying architecture. We like the solitude. We like the acoustics, the wildlife, the things we find, the places we come up, the comments on the walls, the maze-like quality; the sneaky, sly subversiveness of being under a heavily-guarded Naval Supply base or under the Justice and Police Museum. This underground city, like the city above, has its own architecture and atmosphere. It is a place from which the city can be reimagined, as in the dark, concrete drains one can only guess at what might lie above ground. While the archetypal city is one of high rise building and towers, subterranean elements of cities have a quieter and more curious presence in the urban psyche. They seem mythological even when real: some cities have existed entirely underground, such as the ancient city of Derinkuyu, one of 36 underground cities in the Cappadocia region of Turkey, built in the 8th century AD. Some cities, like Seattle, have an underground version that mimics the streets above: when an area of Seattle city was destroyed by fire in 1889, the city was rebuilt on a higher level, burying the previous city streets one storey underground. Some people create their own underground cities, such as William Lyttle, the Mole Man of Hackney, who excavated a vast network of tunnels under his house in Hackney, East London before the council evicted him in 2006. All cities have some kind of subterranean existence, even if it remains unknown and unexplored. 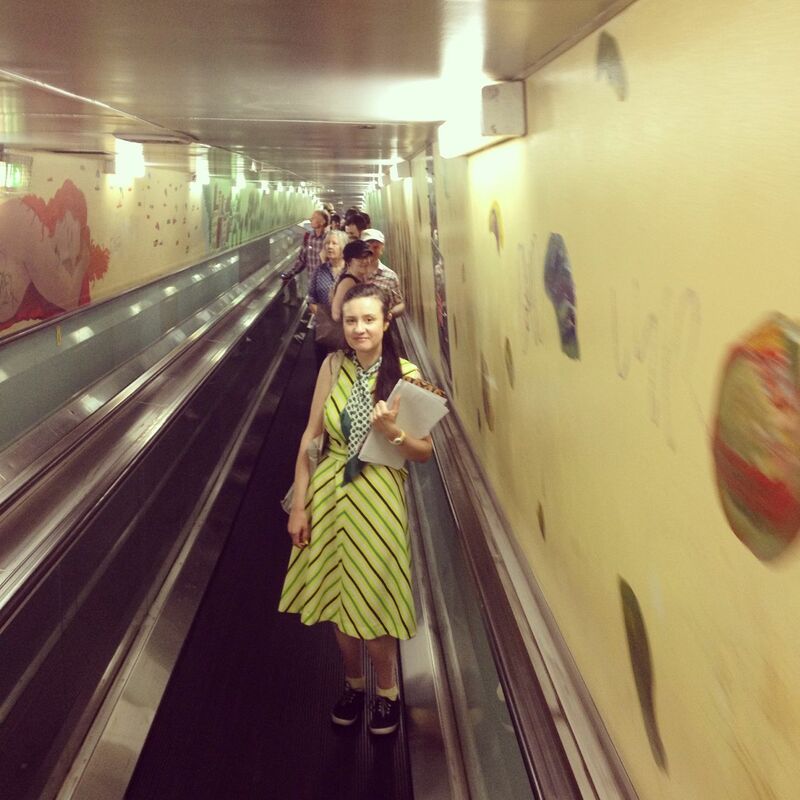 Sydney, a place so feted for its sunlight and harbour vistas, has an underground which mirrors the city above. This dark city is concealed from the everyday and only visible in glimpses, when the city’s surface reveals what lies beneath it. Sydney Morning Herald article about Central station ghost platforms and tunnels. 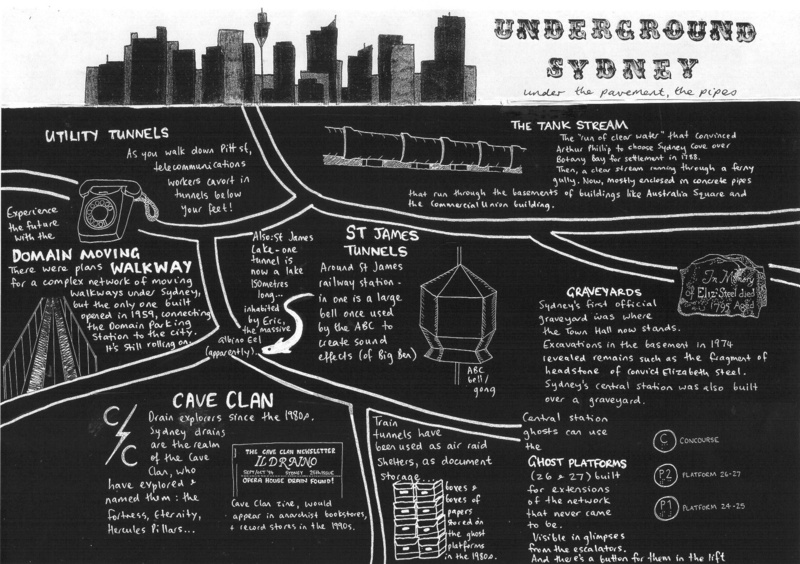 Histories of the Sydney Cave Clan: on Sydney Architecture and Siologen’s blog. Photos of Sydney’s unused rail tunnels and ghost platforms. There is a horror movie set in the St James tunnels called The Tunnel. 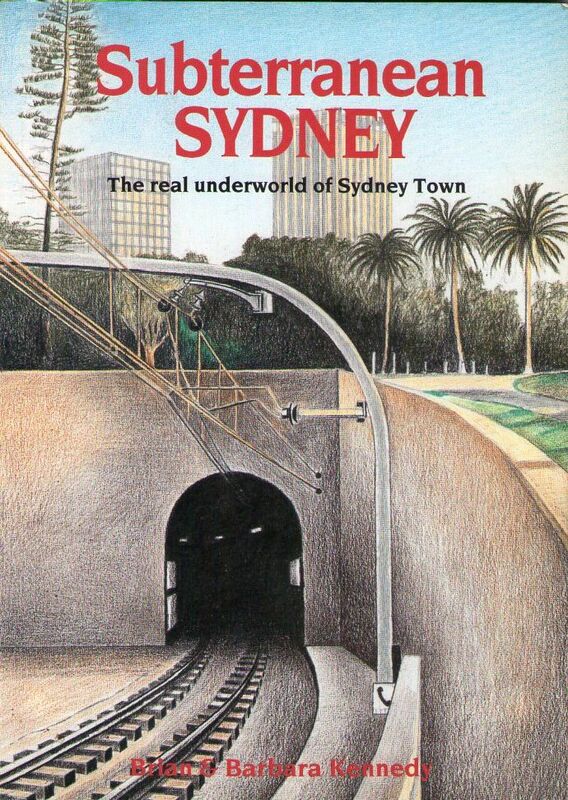 A comprehensive history of Sydney underground can be found in the book Subterranean Sydney by Brian & Barbara Kennedy, much of the information from which can be found on Sydney Architecture.